My name is Max Farjon born in Amsterdam in 1920. This website contains information about a study that I undertook about intelligence. My profession was aircraft engineer and I practiced that my entire working life. I only started with this study in 2010, 27 years after my retirement. I baptized my theory: Theory F.
The search for intelligence appears inextricably linked with the creation of human beings. It was not the result of an examination of the functioning of the brain, but of how animals and people behave as a result of their intelligence as formulated below. This leads to a new way of thinking that also includes human development. The theory can be understood without scientific knowledge about the subject. Central to this theory is the concept of manipulation, understood here as processing objects and material such as bending, cutting, shaping and moving. Intelligence is the ability of the brain to create a new manipulation which is to the advantage of the manipulator. In the final stage of human development, other abilities emerged that also belong to intelligent thinking. 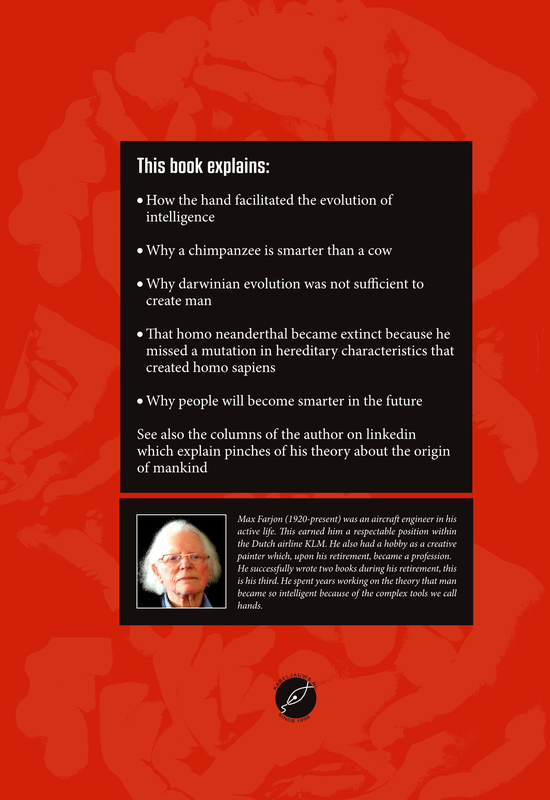 The book postulates a theory F that makes it clear what intelligence is, how it came about and how it works. The letter F is added to identify the theory. This theorem was formed in my imagination and it will turn out that herewith known but not understood phenomena at animals and humans can be explained. As a result, this theorem becomes plausible. 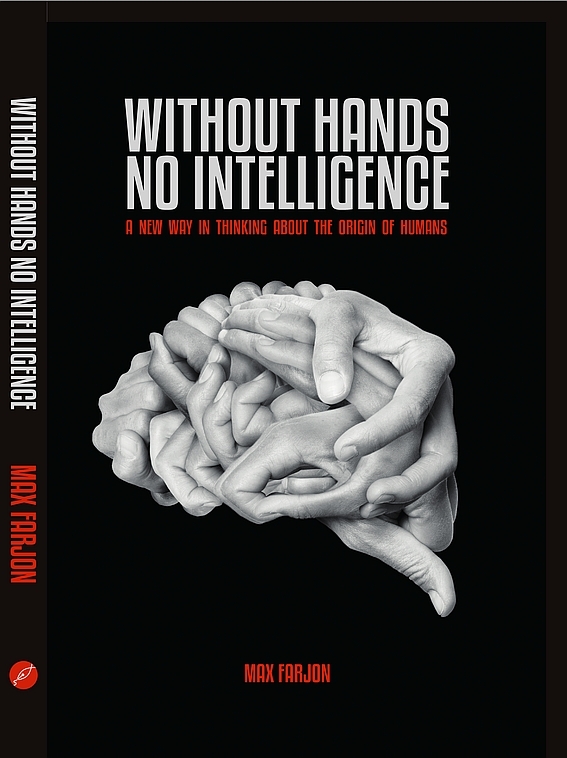 In fact it is like this, although hands cannot think they nevertheless provide the opportunity to the brain to invent complicated manipulations, after all each devised manipulation should be executable, if not then this is pointless. Those hands emerged because its predecessors in prehistoric times chose for a tree existence and developed grab organs to their limbs to move themselves better through the canopies. By a natural phenomenon a population was forced locally to leave the tree. This created bipedalism and the forerunner of the man. He invented making stone tools by which the hands reached the current perfection. This proposition was leading over the past 60 million years in the formation of man. In the last phase of the incarnation also sprung up, next to the manipulations, other operations that the intelligence did grow and at long last the current man did emerge. Think here among others of emergence of spoken and written language, origin of mathematics and development of capabilities to manipulate species. The brain underwent a major change 400,000 years ago by a mutation that created a new feature allowing the intelligence also grew each time a new manipulation or other operation was added to the arsenal. This growth would actually replace completely that by evolution. The special feature of this growth is that it takes place in the youth phase of man and that the growth in thinking ability than happens by increasing the wiring between the neurons. Many civilizations preceded to the ours (Easter Islanders, Mayans, Egyptians, Greeks, Romans). They languished away through lack of challenges. The European civilization is spanned by a long coastline which at the end of the middle ages did arise a flourishing sailing which could cross the oceans and that was not matched previously. With this the whole world was explored and subjected. The technique of building large sea-going vessels with their pulleys and levers, was the prelude to the emergence of a rampant technical capacity that arose the current highly developed society. We have built our own global habitat and will have no lack of challenges for the time being. Seeing my professional past, the theory misses the scientific environment for a successful birth of a new theory. There is not enough time left in my life to build up such a condition. That is why I decided to notify 50 scientists about the new theory. Those scientists were selected on their research objects with similarities to mine. This occurred by sending them a printed book. The book is not yet for sale. But this will happen when the reactions of the scientific world are positive. It is my belief that the new theory is so strong that it will root and outgrow in the scientific world to a new wisdom about the creation of mankind. If youw want to raise a question or to comment on this website, please let me know by e-mail, using the link below.